Newtown Festival wins an Award! The Festival was nominated for a Wellington Airport Regional Community Award in recognition of the work the recycling steering group and the volunteers put into recycling at the Street Fair this year. 50% of waste from the Fair was diverted from the landfill – and they intend to do even better in 2016! At the Wellington City awards on 25th August the Newtown Residents’ Association Festival Committee was announced as the winner of the Heritage and Environment category! The next step is the Regional Awards, bringing together the winners from Wellington, Kapiti, Hutt City, Upper Hutt and Porirua – the Regional Awards wil be announced on November 10th. Recycling at Newtown Festival has been gaining momentum over the last few years. With the Festival being NZ’s largest outdoor free street market and concert, it was agreed that extra resourcing and efforts needed to be directed towards developing a world­ class recycling system. Based on good feedback from 2014, it was decided to combine the waste and recycling systems under one volunteer Steering Committee. 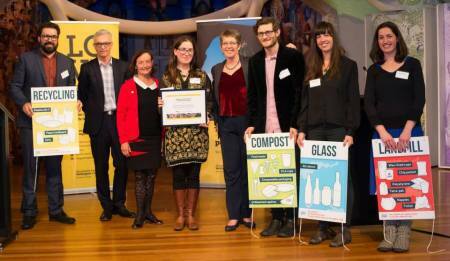 James Coyle, Vanessa Rushton, Renee Rushton (Newtown Community and Cultural Centre), Hannah Macintosh (South Wellington Timebank), and Ben Phillips took on the challenge of making a significant impact on the amount of waste going to the landfill. The success of this initiative marked a challenge to other community and council led events to markedly step up their commitment to waste minimisation. The Steering Committee have already been approached by other large Wellington festivals hoping to replicate the success of the Newtown Festival recycling efforts. Planning is underway for an expanded 2016 effort.